Can I save Money if I Buy Two Cars at One Time? Car Pal Car Buying Service is often asked, “Will I save money if I buy two cars at once?” The answer is, “It depends…” Here’s why. Sometimes a dealer needs two more cars to hit their bonus for the month or for the year. If this is the case, then YES, a two for one deal is far better for the car dealer AND the car buyer. However, this is not always the case. If the car dealer has made their sales objective. It really doesn’t matter. 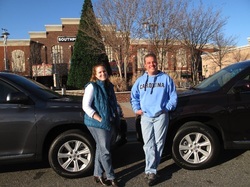 Here, Michael and Carey, who are neighbors, opted to buy their Toyota Highlanders on the LAST day of the month on the LAST day of the year. Car Pal furiously searched and then found a dealer that needed two more car deals to make their year-end bonus. This saved the clients about $5,000 collectively, and after the $695 Car Pal fee, they each STILL saved a LOT of money. Once again, Car Pal car buyer’s agent saved a lot of time and money. Most importantly, Michael Isola said, “This was my best car buying experience ever!’ And coming from Michael, a car buying expert in his own right, that says a lot!